Delta State government is to pilot the Feed Africa Programme (FAP) as former President Olusegun Obasanjo launches a scheme to battle mal-nutrition and ensure food security in the African continent. Speaking at the formal launch of FAP, Monday in Abeokuta, Obasanjo said that Delta State will host the pilot scheme given the state’s pedigree in agricultural programme. He commended the Delta State Government for identifying with the Obasanjo Farms in developing its agricultural sector. In a keynote address, the Vice President (Africa) of the World Bank, Dr Oby Ezekwesili averred that inadequate investment on irrigation was partly affecting food production in sub Saharan Africa but lauded the Delta State Government for identifying with the Feed Africa Programme, Ezekwesili challenged African leaders to get their priorities right in striving to ensure food security in the continent. 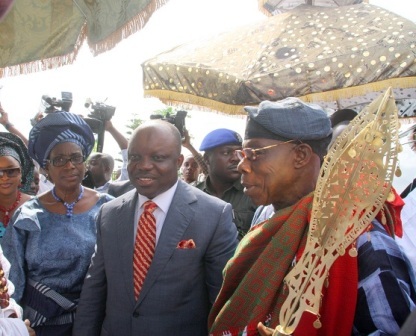 Governor Uduaghan, in his reaction, at the launching of the programme which was part of activities marking the 75th birthday of former President Olusegun Obasanjo, expressed delight at the choice of the state for the pilot scheme of the Feed Africa Programme, noting that agriculture remains a challenge to every government. While saying that the State Government was pursuing a programme of developing other areas with proceeds from oil, Uduaghan said, “most times, the success of agriculture was measured by how much fertilizer was given to farmers which he said was wrong”. He further gave insight into the agricultural Programme of his administration since 2007, which has led to the emergence of a new generation of farmers from the Youth Empowerment through Agriculture (YETA) scheme with the establishment of cluster farms. The Governor said infrastructure such as the Asaba Airport, roads and power were being put in place to encourage investors and went on to say that the OFN/Delta Farms Ltd., a joint initiative of the Obasanjo farms and the State Government was presently producing the highest number of poultry in the country.